Welsh tends to show us characters making the wrong moral decision under disastrous circumstances. The men in his fiction assault the innocent, abuse women, and practice cruelty to animals, while somehow sometimes remaining sympathetically vulnerable. He is at his best with characters so trapped that, even as we see them make abominable choices, we see why those choices feel preferable to the measly alternatives. Marabou Stork Nightmares has as one of its epigraphs a John Major quote – “We should condemn more and understand less,” while Skagboys opens with Thatcher’s “There is no such thing as society.” A problem for the characters Welsh writes about is that the values of their community are so at odds with those of their government – their most important societal prohibitions are against informing on someone to the police, or being a scab during a strike, or failing to back up your mates. Far less odium attaches to welfare fraud, soccer hooliganism, or drug use -- according to traditional working-class values, the worst sin is to be disloyal to your community, and Skagboys demonstrates how Thatcherism made living by these values a lot harder. Leith Central Station, closed in 1972 and by the 1980s a derelict building populated by homeless addicts, in Trainspotting symbolizes a grand civic narrative that now feels empty. Once we learn in Trainspotting that Frank Begbie’s alcoholic father lives in a train station where no train will ever go, in a town that feels symbolically cut off and abandoned by the government, we understand better Begbie’s insatiable need not to feel isolated, such that he has to respond with extreme violence to any perceived disrespect -- and he is paranoid enough to perceive disrespect everywhere. Begbie is one of many characters Welsh uses to illustrate how easily our better instincts turn bad. 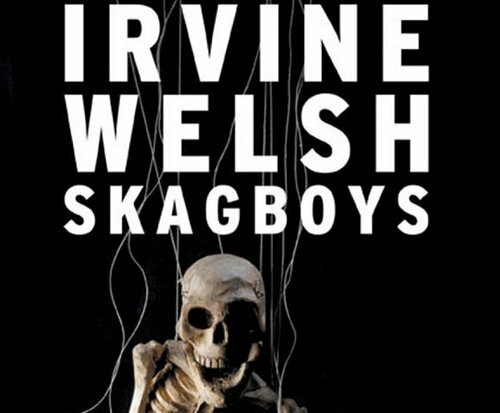 In Skagboys, we sense how what originated as Begbie’s laudable urge to stick up for his mates evolved into his determination to inflict punishment on everyone else. Welsh does not necessarily condemn people for putting self-loyalty ahead of group-loyalty, but he respects patriarchal working-class mores, and has a somewhat nostalgic view of the socio-economic consensus that lasted from the 1940s through the 1970s -- in an interview Welsh has dated the real end of this class truce to the conditions the IMF imposed on the UK in 1976. Renton’s father in Skagboys, Ewart’s father in Glue, are the closest thing in Welsh’s fiction to unambiguously good men, strong yet gentle, salt-of-the-earth Scottish union members, but Welsh hesitates to ascribes the failures of their sons entirely to socio-economic factors. Would someone like Renton have been content with a shipbuilding job in Leith, if Leith still had shipbuilding jobs? The structure of Trainspotting, a series of intense highs and lows without an overall sense of direction, works as well as it does because it fits how life feels to Renton and his friends. Life is a whirlpool, alternately exhiliarating and depressing, in which it’s best not to think about where you’re heading -- local loyalties and male bonding are all the stability these men have, and similar sentiments may partly explain why Welsh keeps returning to the same characters he left behind in earlier works. Skagboys takes us further back into the pasts of the characters from Trainspotting, while also panning out to look at them in a broader societal perspective – sort of like the way the lens zooms in on a subject while the camera simultaneously pulls out in Hitchcock’s “Vertigo.” In a city where unemployment and the supply of heroin are both rising fast, like Edinburgh in the 1980s, why wouldn’t a good classical economist turn to drug dealing? According to Renton in Skagboys, “the postwar optimism was most certainly over. The welfare state, full employment, the Butler Education Act were all gone or compromised to the point of being meaningless. It now really was everyone for themselves. We were no longer all in this together. But it wasn’t all bad, he considered; at least we’re getting a wider choice of drugs now.” Part of the appeal of drugs for Welsh is that they let people share experiences and, in the case of Ecstasy, taste something of the solidarity he suspects was more naturally attainable for his father’s generation. Much dark humor in Welsh’s work comes from the contrast between the ideal of how society is supposed to function, reflected in his ironic references back to Adam Smith and other thinkers of the Scottish Enlightenment, and what he thinks we actually have – a system that can be cynically exploited by sociopaths adept at lying and finding loopholes, while offering little to the truly needy. A man who lies and poses as remorselessly as Sick Boy can exploit most of the women he encounters, while Begbie can win any fight since he never fights fair, always carrying concealed weapons. Those who start off with little and play by the rules, like Spud, are doomed. Welsh’s protagonists must navigate a world filled with predators – “predator” is a word he uses a lot -- and born victims, while hampered most of all by the predator and the born victim within themselves. A policeman in Crime puts it this way -- “Fifty per cent of people are honest. You could forget all about them. They might commit minor misdemeanors, but they basically lived their lives toeing the line. The other 50 per cent were divided between the evil, about 10 per cent, and the weak and stupid, the other 40. Again, the evil weren’t that important in the calculation; they were just there to be hunted down. The key group was the weak and stupid. They were the main perpetuators and victims of crime.” In Welsh’s fictional worlds at least, these proprotions roughly hold – the percentage of evil people within the police force itself, he estimates rather higher. According to this model, a dose of Thatcherism is unlikely to do the “key group” much good -- given that many predators can succeed in passing themselves off as squarepegs. Welsh has a Calvinistic streak in him, but even the worst of his heroes long intensely to be good -- even if this longing is submerged so deep in them that only an omniscient narrator would be able to find it. He sees violence and desperation very close to the surface of daily life. Skagboys contains some of the darkest moments in all his fiction. It begins during the Miner’s Strike, with a scene of organized police brutality against protesters that culminates with the disillusioned Renton getting off the protesters’ bus to go clubbing -- a scene foreshadowing his eventual abandonment of his social class. Society may not exist apart from families and individuals, but Skagboys makes a convincing case that, once society starts breaking down, families and individuals have a way of breaking down too.